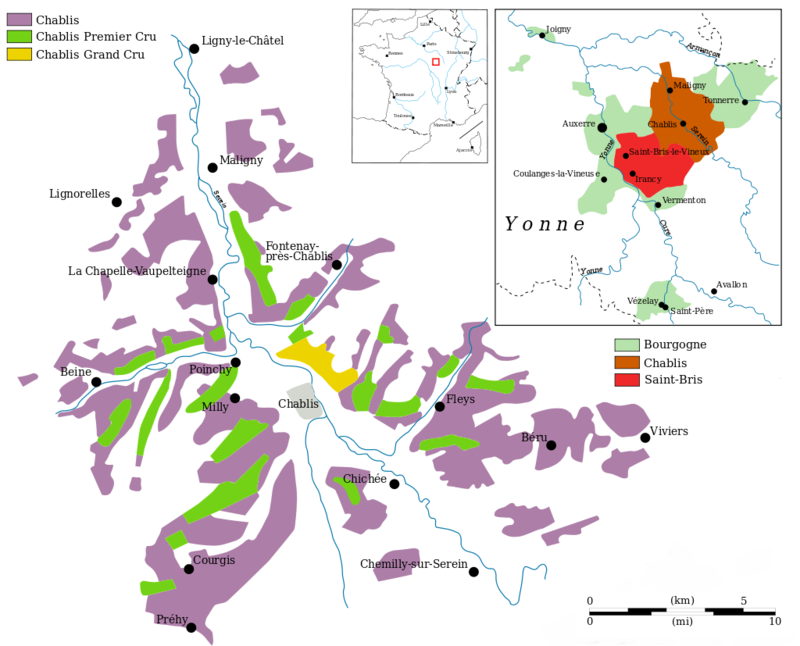 The appellation is a few kilometers southwest of the area chablis and southeast of Auxerre in the northwest of the Yonne department in the French Burgundy, The former VDQS division "Sauvignon de Saint-Bris" was classified as AOC in 2003. Before the introduction of the Appellationsregelung the wines could be called from here as Chablis. The vineyards cover about 130 hectares of vineyards in the communities Chitry, Irancy, Quenne, Saint- Bris -le-Vineux and Lottes. The white wine is considered a novelty for Burgundy Sauvignon Blanc and Sauvignon Gris vinified. Wines out Pinot Noir or Chardonnay be considered Bourgogne Côtes d'Auxerre marketed. Well-known producers are William Fèvre, Dom. Sainte-Claire and Dom. Sorin de France. This page was last modified at 6 November 2017 at 16:54.